Your next wine night in should raise a glass to Stan Lee. Pop open a bottle of sparkling like the bubbly (and affordable) Gloria Ferrer Sonoma Brut and celebrate the man who gave us Marvel superheroes. Or, if you have a Tony Stark budget, opt for the Veuve Clicquot. Cheers! You made heroes out of women; I am so grateful to have been one of them. Thank you, #StanLee. Today, my inner-nerd is saddened as I mourn the loss of Stan Lee of Marvel Comics. Many of you may not know Lee by name but you surely know him by his work. Creator of Spiderman, Ironman, the Incredible Hulk, Thor (insert dreamy sigh here), Black Panther, and so, so many more, Lee was a Disney Legend whose characters have changed the movie industry for the past decade. For the next few days, you’ll probably hear a lot about this legend, his impact on the entertainment industry, and the legacy he will leave behind. You’ll also hear about all of those Marvel Cinematic Universe (MCU) movies and his cameos. I hope your interest is piqued, and that you’re ready to see what all the MCU fuss is about… BUT be warned. You cannot just jump in and start your journey with any movie. Below, I outline the method to this beautiful madness! Iron Man This is the film started it all; do not skip it! The Incredible Hulk – He was a man. There was an accident with gamma radiation. He now has anger issues and turns green. You can now skip this movie. Iron Man 2 – This movie gives you the first appearance of Nick Fury and Black Widow. Don’t skip it. Thor – Can it be skipped? Yes. Do I support skipping Chris Hemsworth as Thor? No. Captain America: The First Avenger – It’s crucial to the universe- do not skip! Marvel’s The Avengers – This is the first Avengers film. You cannot, and should not, skip it! Iron Man 3 – eh. You won’t be lost if you need to cut this one from your watch list. Thor: The Dark World – I’ve seen it and I still cannot tell you what happened. Skip it. Captain America: The Winter Soldier – DO NOT SKIP. Guardians of the Galaxy – This is an outlier as none of these characters are members of the Avengers. However, they come into play in Avengers: Infinity War. Its not a must, but it is definitely entertaining. Avengers: Age of Ultron – Never skip an Avengers movie. Ever. Ant-Man – I still haven’t seen this one and I’m not lost. Captain America: Civil War – DO NOT SKIP. Doctor Strange – This movie is not like the others. Your kids won’t love it, but it will appeal to your more intellectual side. And its Benedict Cumberbatch. Guardians of the Galaxy Vol. 2 – Haven’t seen it and I’m ok with that. Although I did hear Baby Groot is pretty cute. Spider-Man: Homecoming – The casting really brought this one home to the tween girls with Tom Holland. You don’t want to miss it! Thor: Ragnarok – Do not skip this movie! And get to it as soon as possible. It’s my favorite. Black Panther – Watch it. Then watch it again. And then watch it again. 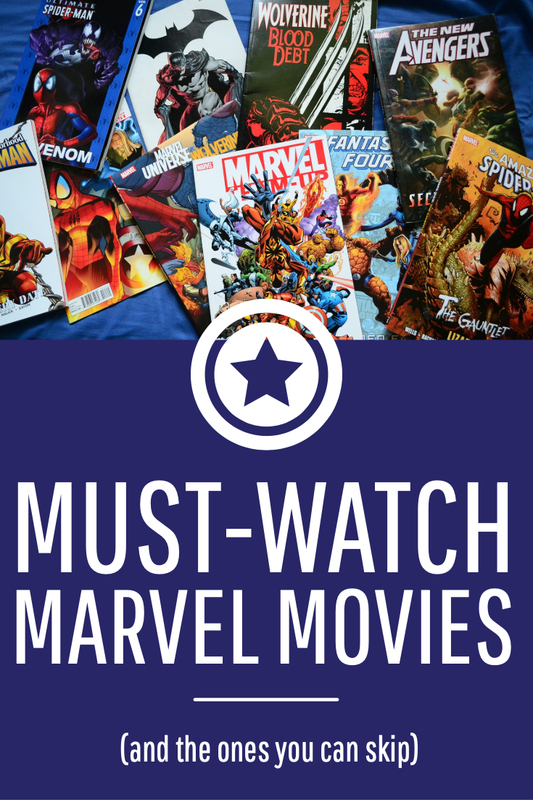 Unlike most of the other MCU movies, you will not be completely lost if you see this movie out of order, but it is even better if you’ve got the background. Avengers: Infinity War – Watch it (in order), but bring the tissues. AND DO NOT SKIP. Ant-Man and the Wasp – Starring Paul Rudd and Evangeline Lily, they need to cut their loses on this franchise. Skip. Captain Marvel – First female lead in the MCU?? I’ll be there opening night in March 2019!